All4Israel - Border Police Officer St. Sgt. Solomon Gavriya was one of three victims murdered in the Har Adar terrorist attack. Border Police Officer St. Sgt. 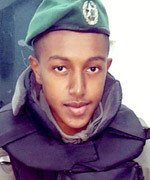 Solomon Gavriya was one of three victims murdered in the Har Adar terrorist attack. September 26, 2017 - Border Police Officer St. Sgt. Solomon Gavriya, 20, of Be’er Yaakov in central Israel, was one of three victims killed in a terrorist attack in Har Adar, a settlement located northwest of Jerusalem. The terrorist held a work permit allowing him to work in the settlement, but when he aroused the suspicions of the security personnel he drew his weapon and began firing, killing Gavriya and two security guards, Youssef Ottman and Or Arish. Staff Sergeant Gavriya enlisted in the Border Police 18 months ago and was assigned to patrol the greater Jerusalem area. Six months later, in October 2016, he was injured while preventing a terrorist attack in Mevaseret Zion. Despite his injury, Gavriya, whose family emigrated from Ethiopia, insisted on returning to duty two months later. Police spokesman Micky Rosenfeld said that in today’s incident, Gavriya saved a number of lives by promptly responding to the terrorist’s gunfire, and was posthumously promoted to staff sergeant. Staff Sergeant Gavriya is survived by his parents, a sister who is also a soldier and two younger brothers. Accompanied by thousands of mourners, he was laid to rest in the Be’er Yaakov cemetery on Tuesday night September 26th.